Tiago Della Vega just might be faster than a 'Bumblebee'! Well, he did it! 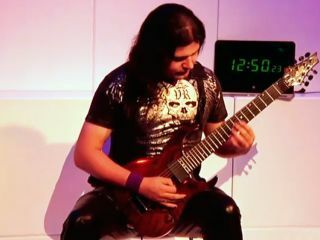 Tiago Della Vega, the world's fastest guitarist, broke his own Guinness World Record at the Consumer Electronics Show (CES) in Las Vegas yesterday. The Orange Amps endorsee used the company's OPC as he made his way into the Guinness book... once again. In 2008, Della Vega grabbed the title of 'world's fastest guitarist' when he performed Nikolai Rimsky Korsakov's Flight Of The Bumblebee at a mind-boggling 320 BPM without making any mistakes. Yesterday afternoon, on the Intel stand at CES, Della Vega went 20 beats better, plugging in his custom signature Andrellis 7-string guitar into the OPC and playing 'Bumblebee' at a bracing 340 BPM - with no goofs!. Word is that Della Vega is already anticipating another record-breaking attempt. How fast can he possibly go? We'll keep you posted. Go here for more on the OPC.